He didn’t wait till we were pure. He realised we could never pay the debt for our sins by ourselves. He knew we could never be cleansed by anything other than the precious blood of His only Son. So, He took care of the situation before we even acknowledged Him. That is what love does. It is proactive. It takes the initiative, it bears the blame, it takes the place of a scapegoat (just as in our case, God came down in human form as the Messiah). He died in our place and rose again. This is what we celebrate at Easter. This verse packs so much strength and comfort. It’s like a glass of cold water on a hot day, like a soft bed when we’re tired. It assures us that whatever we need, we can trust God for it. He willingly gave us Jesus. He sacrificed Him even before we knew we needed a Saviour. Every other thing we need is too little in comparison. To me, Romans 8:32 is one of the best descriptions of God’s unparalleled kindness in the Bible. “7. Ask, and it shall be given you; seek, and ye shall find; knock, and it shall be opened unto you. 8. For every one that asketh receiveth; and he that seeketh findeth; and to him that knocketh it shall be opened.” Matthew 7:7 & 8. “… ask, and ye shall receive, that your joy may be full” – John 16:24. Do not feel it’s presumptuous to expect God to be kind to you. He does it freely to everyone else, how much more to His children! “… your Father who is in heaven … makes his sun rise on the evil and on the good, and sends rain on the just and on the unjust” – Matthew 5:45 (ESV). So, know that all that is good for you, God will do. Feel free to talk with Him and never forget that He who did not spare His only Son but gave Him up for you will gladly give you whatever else you need. You are superbly blessed in Jesus’ name. The scriptures used in this post are from the King James Version of the Holy Bible, except where otherwise stated. Wow! I love these thoughts you've shared with us ma'am. More importantly, I'm blessed and lifted by them. It's a cheering and comforting, may I add, very concise reminder of what provisions Abba has made for us. We like to struggle, and do it all alone and when results aren't commensurate with efforts, we grumble, complain and become frustrated. Thank God, this need not be our story anymore! This love that brought us all things via salvation is a Wonderful Love! Oh yes, it is a love beyond compare! May your testimonies of this love remain constant and abounding in Jesus' name. I love Easter so much.. you know why?? It's the only time I see what God has done for me and you. He died for a sin he never committed jst to make us pure of our own sins, isn't that selfless? He humbled himself down to the extent that he was spit on jst to make us pure. He died just for us to have life and have it more abundantly, isn't that great? He suffered on the cross jst for us not to suffer again in life. What more do we need from this God? He has paid the price of salvation, has redeemed our souls from death, has shown us love at all cost. What else do we need.....????.? You are richly blessed in Jesus' name, Emeka! I suppose you mean, "What else do we need that He can't provide," to which the answer would be, "Nothing! Absolutely nothing!" Christ died even when am not worthy, unconditional, excess and selfless love. I feel guilty that even after sacrificing him self, that I still commit the same sins. Lord, may I be cleansed by your precious blood, help me to be yours and yours alone. Thanks for reminding me of his undying love for me. God bless you. I say "Amen" to your prayer, Amaka! It is well with you in Jesus' name. Wow! This is the best way to start your day, posts that get me to sober reflections! It's almost your birth month, ma! I'm excited.. This festive period is for me, the most important of them all. He was wounded for our transgressions! He did not wait till we were pure! Look at that! He took care of the situation before we knew it. Isn't God amazing? Why do we worry? We serve a God that takes care of our needs even before we ask him. Thank you, Aunty Edith, for blessing my soul. Let me visit the second blog for loads of inspiration! God bless you bountifully, Jennifer! Your enthusiasm is infectious. The thoughts shared in this post go to demonstrate the unconditional love God has for his children who are truly redeemed by his blood. while reading the post, I took a reflection on my life, examining the love of God,nall I could see is that his love is never failing and always available and his promises are still "Yea and Amen". I am highly inspired and grateful. Thanks for sharing these thoughts, Ma. God bless you. I feel so guilty by this spiritual thoughts shared by our lovely mother. You know! Sometimes I ask myself what will be my faith if only God is a man, where will I be and how do I live? this questions continues running through my thoughts each time I realize the love of God and his goodness in my life, But nevertheless I still believe he is God of love and wonders because he thus said "Be still and know that I am God". His words are true, in them i find solace. God loves us, even though sometimes through certain situation we feel he doesn't. This post was very helpful to me, i might just have gotten back on track. Glory to God and a bouquet of blessings to you, Evans! I love the concept of this write-up. I love the way u gave us a verse and then explained the meaning in a way that relates to us. I hope you do more of this and may God continue to bless u ma. Thanks a lot for the feedback and God bless you too, Ugochukwu! What God does in our Life is marvelous. To describe it is hard for me. Despite the fact of all our inabilities, he still loves us. God's name will be proclaimed by me and my family till the end of time. Thanks for this article b/c no one motivates and inspires me the way you do. God bless u. Glory to God and God bless you too very much in Jesus' name. am blessed ma. its indeed a good way to start one's day. what will I ask the Lord and he will not give me, when he provides for the birds of the air, is it me he can't provide more for? am grateful to God for his abundant blessings, mercies and unequal love on my life, and plead for more of his grace to steer clear of sins, for the spirit is willing but the body is weak. Amen to that lovely prayer, Chinaza! You are lifted in Jesus' name. Love of God is obviously second to none. His love for us was so immense he had to send his only son to die so we could be saved. What love is more real than that? This is also a clear indication that everything we want is at our disposal when we ask through Christ our Lord. Christmas is festive and gives very little room for meditation. But Easter is my best. And the Lenten season that precedes it, during which we have time to meditate on our lives, vis à vis God's unparalleled love for us. I love the quote: "God's word is like a glass of cold water on a hot day..." It spoke to me. The perfect write up for the perfect season! God has shown us all the love and forgiveness of sins there is to show to us. It is left for us then, to reciprocate this love, by serving him truely and with all our heart. This reminds me all over again that the celebration of Easter is something more than rice and meat... what happened at cavalry was indeed an act of love and no one else on earth can beat that. God is love, even when he gave his only son, his love for us is unconditional, all we need is him, i can't imagine this world without God, he is merciful God. we need to put God first in everything we do. This is true Aunty Edith, God's love for man is invaluable to the point he didn't mind sending his own son to die for mankind. I don't think there is a greater love than this anyone can show to his loved one. I appreciate him for that because with this love of his, my salvation from damnation in eternity will be assured. God's love for us is immeasurable and indescribable. Thank you Lord for giving us your son to die for our sins. It's so easy to forget, in the hustle and bustle of things, that God is love & loves us just as we are, unconditionally. This was a lovely reminder of that love. wonderful piece especially now that we are about to enter easter, we are advice here to appreciate the love of God for us because its because of his love that he sent his only begotten son to come and die for our sake, we should try to stay away from sin so that his sacrifice fo us will not be in vain. These kind of passages in the documented word of God, the bible, keeps me going most especially the days i have doubts on whether am worthy of undertaking the kingdom task. but am reminded that my previous, present and future sins have been forgiven. all that i pray is that i may know him more and the power of his resurrection. God's love for the whole world is unconditional. This unconditional love for the world drove him to die for the world. If a sinner accepts what Christ has done, God will take him as his own child and freely give him all things. This post, just reminded me of a Christian peom; "jesus, who gave himself for me upon the cross".... His mercies are boundless He never forgets to show mercy to poor sinners like us! I pray that we all bond in this unending Love. Amen. The love God has for us is greater than any other love we can think of. Aunty Edith the way you split the scriptures explaining Gods love for us and explaining them is simply amazing. I am always strengthened when i reassure myself of the love of God for me.. And really, i find solace in these words: while we were still sinners, Christ died for us.. . my prayer is that i will always be a reflection of God's unending love for mankind.. AMEN.. . The love of God on us is so much that he sent his only son to die for our sakes. He loved us even though we weren't saved.. This period is gives us the opportunity to think about his love and to find better ways to please him. His love for us is agape, not even our sins can make him change his love toward us. He died on the cross, where love and grace met. oh! what a love. I have never doubted God's love for me because I can feel his presence around me. He has been with me through hardships and made me tough to handle it. am inspired ma, God's love is the greatest of all. his mercy endures forever. thank you ma and God bless you. I was really touched by this post. The way you elaborated on his love for us makes me feel terrible that often times we take this love for granted. I pray that the good Lord gives us the grace to love him just live he loves us. God bless you ma. Easter is the period our lovely father suffered and died for us sinners.His love for us is unconditional.Please lord give us your grace to always do things that will please you especially this Easter period. Ma this is a reminder to us about the love of God which is the best love one can get ,his love doesn't fade it's everlasting,indeed Easter is a perfect time to show love to one another. There is a song i love singing which says "no one ever cares for me like Jesus. There's no other friend so kind as He. no one else could take my sin and darkness from me. Oh! how much He cares for me". Each day, i am reminded of God's love for me, and i know that no matter what the situation might be, i have a friend who would never leave me nor forsake me. we are so undeserving of God's unconditional and unmerited love for us. God still loves still loves and is still waiting with open arms for us to run to him, irregardless of our negligence, promiscuity and procrastination of the word of God. what then shall we offer unto this Great and merciful God? if not but to live a life that pleases and glorify him. Sometimes I look at myself before going to meet God in privacy , I ask myself... Am I worthy to stand before my creator? His love ND grace is what automatically keeps me going and nothing else... . When compared Easter with Christmas, I think I have preference for Easter over Christmas. Not necessarily that Easter is more important than Christmas, but simply because it's a period when I reminisce and ponder over GOD'S love to human. HIS love is superintendending, and incomparable. What do I offer to the Lord if not to praise, worship and adore HIS holy name. I love you, JESUS. God gave up his own son for our sake and is willing to do more if we accept Christ and live a holy life. Easter is season of sober reflection, let's always remember and appreciate the love of Christ which is the greatest gift one can have. God's love for us His children is unquantifiable and that is why his mercies are new every morning. i believe am a manifestation of God's grace, even when things don't seem to work out the way i planned i know God's mercy and love has always been sufficient . just as He said in Matthew 7 that we should seek and we shall find, but most times we are too busy with our situations forgetting to seek Him that can do all things. i pray God give us the grace to seek Him in all season because His death on the cross has broken every restrictions that prevent us from coming to Him. He is now our Loving Father. God bless you ma your messages has a way of giving me a sober reflection. While we are yet sinners, Christ died for us. God in his infinite mercy and faithfulness, has showered us with grace and favour of the season-Easter. Christ is the hope of our glory.our responsibility as Christians in order to reciprocate to God's unlimited love is to obey his word and be his ambassadors on earth. what i sincerely pray for each day is for the grace of God, there are so many things clamoring for our attention and they could be distracting, only the grace of God helps us to stay focused and have a meaningful thought towards His birth and death on the cross. God's love for us knows no bound he has been good to me even wen I dont deserve it. A lot of situations has made me to believe in him despite my non chalant behaviour. Our God Loves us all beyond measures. He is Love himself. He provides for us even when we have not asked. No wonders he implores us to pray in secret because "... Father knoweth what things ye have need of, before ye ask him. (Matt 6:8) KJV. Go on, Ma. The God you are working for will Reward you. God, Bless you! GOD HELP ME TO LOVE YOU MORE EACH AND EVERY DAY...THANK U JESUS FOR SAVING ME. I am sorry Lord that I offend thee always, this Easter season is a season of total repentance nd turning back to you Lord.ACCEPT ME LORD AMEN! God love is unmeasurable and not the kind of love that segments. It covers both the saved and unsaved. Just the single act of giving his son up for the redemption of our sin is a singular act of a love that can never dimnish. Even when his son ascended, he sent someone greater'the holyspirit' who is an embodiment of all we need to sustain our existence both spiritually and otherwise. Am forever grateful that i came to know that truly there is a true father in heaven. Thanks ma! You are wonderful in your own way. "He realized we could never pay the debt for our sins by ourselves. He knew we could never be cleansed by anything other than the precious blood of His only son". many people have been blinded and deceived into thinking that doing good works can buy them salvation without knowing that their only guarantee to salvation is Christ's blood on the cross. Many believers are yet to see and accept the fact that they have heavenly blessings in Christ Jesus as heirs to His kingdom. i pray that the eyes of our understanding and enlightenment will be opened more to all these. The greatest salvation plan he drew for his children. I’ve giv’n to Jesus everything, Now I gladly own Him as my King, Now my raptured soul can only sing Of Calvary. Thank God that even ' the poor me' now can swim in the splendour of God's loving kindness. God bless you real good ma. I have no denial that God loves me so much. For Him to Send to His son to die for my sins is enough evidence of his overflowing love for me and the rest of his people. Thank you Ma to reminding me of God's love and for the prayers. God loves us that he gave his only son for our sins, who I'm I to deserve such love from the Almighty God? ?, thank you Lord for this is a reminder to me about the unconditional love God has for me..
All have sinned and fall short of God’s glory but God who wants to maintain our union with Him, still seeks for us, His lost sheep. He therefore sent his Son Jesus Christ, the good Shepherd, to come and search for the lost sheep. God is kind to us even in our sinfulness. He allowed His Son to die that we may live; to become humiliated that we may be uplifted; to become a slave that we may be free; and to become poor that we may be rich. We can only reciprocate this Divine kindness by loving God and our fellow human beings and by avoiding sins. God z a compassionate God....all we have to do z to turn away from our evil deeds and seek d face of God for he will take us back...this we can only achieved by loving God and our fellow human being as well. God loves us so much...bless u ma!! The death of christ marks a very significant moment in the life of every believer. It is the hope of salvation unto them that believe, a promise of love, of sacrifice and our eternity with christ. christ death on the cross represents christ as love. God knows our needs And hs made provision for them, he knows what will happen in future and what we will become. He knew we could never be cleaned by anything other than the precious blood of his only son and he sent Jesus Christ to us . Our God is a wonderful God. God's love For us is overwhelming, each day, every hour and minutes that I think about the things he is doing for me, I'm just speechless. He accepted humiliation for my sake even when I'm wallowing in sin. Father please Grant me the grace to Live according to your will. I like the 9th point " … what man is there of you, whom if his son ask bread, will he give him a stone? ". This simply shows God's love for us. Unlike us humans, none of us can give up a penny talk less of someone we love. ''HE WHO GAVE UP HIS OWN SON" The greatest of all sacrifices known, a befitting description to unparalleled kindness, a deed that cannot be measured up to, God you are forever great and loving. I found myself crying within and all i could whisper to myself is; This Jesus and His love who takes away the sins of the world. I asked myself when am out of the track ;" How do you feel when the person you love completely is hurting you by his/her actions?'' For sure, it hurts me and don't want to be cheated but this is the same way Jesus feels when we are lost against Him.Thank you father, for your love is kind, patient and your love is unconditional. God's love for us is immeasurable and that is why he was able to give his only beggoten son to the world to bear our iniquities and die a shmeful death for us on the calvary, i see no love which surpass that. though christ was with a sin but yet he die for sinsbecause he knows we are human and can not sacrifies to clease our siin . God is able. What better write up about Christ's love than that with scriptural backing and the whole package of God's love at one reading. I was blessed by this message and I know that the readers are blessed by this too. God bless you for your edifying messages. God's continuous grace on you amen. the 7th and 8th point actually reassured me; "Ask, and it shall be given you; seek, and ye shall find; knock, and it shall be opened unto you... " For every one that asketh receiveth; and he that seeketh findeth; and to him that knocketh it shall be opened" thank you. Gods love is immense in pur lives. Lovimhbus truely. Protecting us, providing for u s and most of all giving his life so that we may live. There is no greater love and sacrifice than that. He is A Selfless God. Easter is around the corner, it is an important moment in every Christian life to appreciate the gift of life and the raise of Christ Jesus. Through is death we all where redeemed and clean by his blood. i still can't phantom the lenght of God's love for man that he had to give his only son as a sacrifice for the redemption of mankind. l still can't imagine the shameful pain he went through on the cross so that i might be saved what manner of love can be compared to this.. it is a priviledge to be called a son of God and for this we must leave to please him cos thats all he desires.. thankyou ma for this wonderful write up am so blessed. Actually it is an extravagant love.a love undiscribable. I can't imagine the shame, pain.Jesus took my shame so I don't be ashame anymore.thank you ma for this write up reminding is that Jesus has paid it all.we need not cry,nor worry nor even be depressed because we are saved. 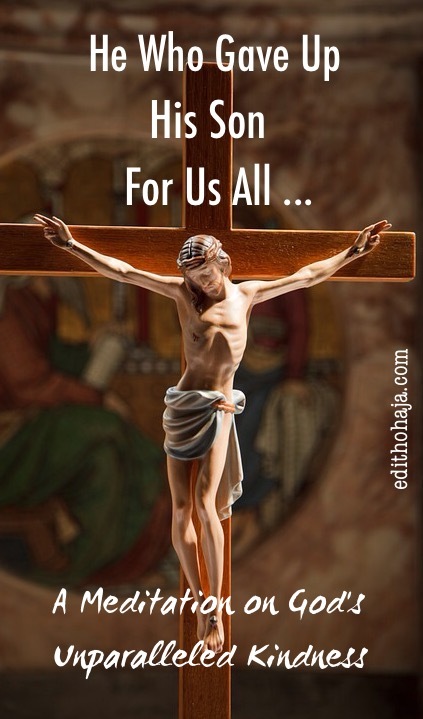 Unlike humans, God in his infinite mercy gave us his only begotten son to die for our sins. Because of this love, Easter has been marked out by Christians to commemorate the death and resurrection of Christ which Mark the salvation of Man.Nice one ma. God sacrificed his only son for our iniquities,the least we can do is worship and acknowledge him with all our hearts.A very inspiring one ma,God bless you. The love of God for his children is unflinching and unwavering. As a songwriter sang 'God you pursue me with power and glory, unstoppable love that nevers ends,you're unrelenting with passion and mercy'. In Romans 8:35, the bible admonished us that not even tribulation, famine, trials can separate us from the love of God. We his children should always remember that the love of our father supercedes all and his love has made a way for us to come into his prescene boldly. Gods love is unconditional.it is an extravagant love an immeasurable. He is awesome. knowing that Jesus died for me is a sensation that sweeps me off my feet. all my talents, abilities, energy and vision will have been wasted without him. i wonder the nature of love God's love that he could permit his son to die for our redemption. i am a living witness of the magnanimity of his grace. glory to God. I BELIEVE I AM A SINNER AND THAT JESUS IS THE ONLY ONE WHO MADE IT POSSIBLE FOR ME TO RECONCILE TO GOD. I BELIEVE THAT IF I CAN HUMBLE MYSELF AND PRAY, HE WILL HEAR ME, FORGIVE ME AND SAVE ME FROM MY WEAKNESS. THANK YOU MA FOR THIS REVELATION AND MAY THE JOY OF EASTER BE WITH YOU, AMEN. There is no man anywhere in the whole wide world that can love us the way Christ does, His love for us passes all understanding. The greatest love one could ask for is the love of God, for without this love we are NOTHING. i love your post because it reminds that my God would not desert me in my time of trouble. What else would we need and long for that he has not given to us. Ma, God is using you a lot to pass a message of reminder of God's love for humanity. Thanks a lot and may God continue to bless you. well, it is always a sign of love when this kind of a masterpiece comes up and for you ma, to bring this topic is nothing but to remind us especially we the Christendom about the unconditional love Jesus had for mankind and as the Easter is quite approaching, it also call our attention to the fact that God really care for us that he gave his only begotten son to come and died for us so that we might have everlasting life. Even before we were born, God has already made provisions for our stay on earth. He knew we cannot pay our debt by ourselves so He sent His only son. He didn't wait for us to be pure. His love for us is unconditional that is why whenever we wake up to a new day, it is very important to give gratitude to our maker for His endless and undying love for us. it is a very good feeling to be motivated like this all the time. This piece actually exposes me all the more to the understanding of the richness of God’s love for me and indeed all and sundry. Reading this very piece online has actually imbued me with true sense of self-recovery, hope, even when I feel wronged or living in lack. There is a testimony of joy in my heart. Nonetheless, this piece is indeed a therapy to heart distressed by ill of sin including other issues of life and who have lost hope of experiencing God’s riches and providence. It is therefore my prayerful wishes that all who have read this piece be given the spirit of discernment to know the truth of God’s love for us thereby appreciating Him in our lives and by extension loving our fellow human beings. The love of God for his children is deep. And everlasting,he even demonstrates this by dying for us there is no greater love than that sacrifice yet we still sin and some donot even acknowledge the fact that he paid a price for us.we really need to talk more to good and redeem our selves. He that did not spare his son but gave him up to us,how will he not so also along with him graciously give us all things. What other love will be more than these.God love is not proactive, he loves us and he also cares for us, we Christians need to mediate on this and stop lamenting when faced with some issues. Gods love for us is unconditional, not withstanding our short comings He is still merciful. His love for us surpasses all others. Thank you Jesus for loving me!.Thank you ma for revealing this to us, God bless you. God's love for us has no limit, and brought Jesus to break all barriers that will hinder us from getting an easy access to him. What do we own? Nothing. We may have many material things and neglect God but when God neglects us we will be lifeless, but God won't do that because he is the ever merciful Father of all His creatures. Jesus had free will and could have chosen not to die for us but because if the love he had for us and because he wanted to vindicate his father's name he did as prophesied. We can show our appreciation for this by living in accordance with Jehovah's laws. He is forever patient, and forever loving. When we had so gone astray that it seems to trace out route back to our creator is impossible; or even when it seems our sins are too much to be forgiven, God still calls on us to back; to return to Him. He had promised in the past to forgive all our iniquities, and to make our wretched, blackened souls as white as snow. that promise made thousands of years ago,is still open and can be enjoyed by the latter years Christians. as a prove of His love, He gave His only son to die for our sins. Tell me, what more would you want to see before you believe in God's love and care for mankind? If can still remember what happened in the Gospel Of Luke (chapter 15; from verse 11), where Christ used a parable to illustrate the immeasurable love of God to mankind - his children. That story is meant to inculcate in our minds the love and willingness of God to always accept us back whenever we erred; to forgive our iniquities; and place us back in His sheepfold. Why can't we, as Christians, reciprocate such love by anchoring our faith on God, and believing in Him always? John 3:16, tells us "For God so loved the world that he gave his only begotten son that whoever believes in him will not perish but have eternal life." This is the greatest gift ever given.By giving his only-begotten Son, Jesus Christ, as the ransom, God gave mankind the prospect of life everlasting and freed us from the bondages of sin and death. This message is so emotional.Jesus Christ died for us so as to wash away our sins. There is need to become a born again christian. 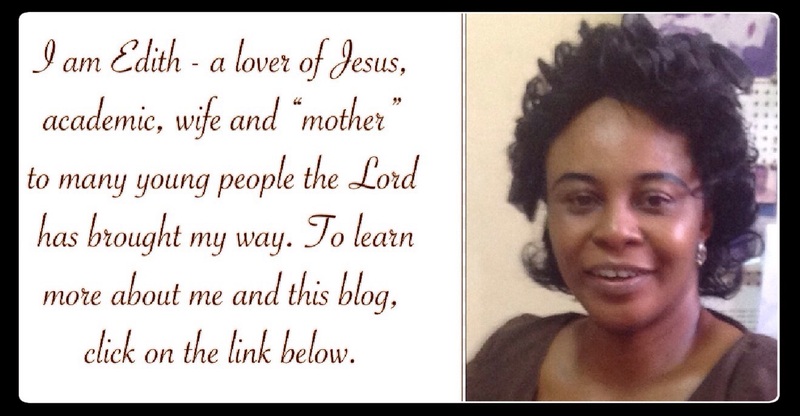 This particular message is awesome and may God bless u, Aunty Edith Ohaja for that piece of message. God's love is unending and everlasting, blessed be his name AMEN!! What is man that God is mindful of him? Not only because we were created in HIS image, but such unmatchable love HE has for us, that he sent his son to bear our sins. Its an honour to be loved by God.. The love of the father is simply unparalleled, irrreplaceable and unfathomable. The nature of the love of God is just inexplicable. it takes more than mere human feelings to give up a son for the sake of a bunch of sinful individuals. God's love for us is excess...He gave is only son for us that we might not perish, but have live in abundance. And that settled it all. Thank you ma, for this nice piece. The love God has for us made him give up His one and only son for our sake, even when we were in sin. If He could give His only son for us, we are really precious in His sight. He makes sure nothing takes his children from him. This shows the extent of his immeasurable love. He did not deny us his son in our misery. How thoughtful this post is, very nice. God sent his only begotten son to come and die for the sins of the world, love simply means sacrifice, God knew that the only way to liberate man from sin was to send his only son. How can we pay him back. We are grateful to you Lord for this unending love you have shown us. There is no kind of love that can be compared with the love of God.Giving us his only begotten son in attornment for our sins is indeed enough to make us know how much he loves us.He sent his son to die for us because he knew we can't pay the debt.He also knew that, it's only his blood that cleanse us from our sins.i am very very happy to loved and blessed by God.nice post ma. The Justice of God made him give his son to save both the wicked and the just. He sends the rain for the evil and the good, willing to accept anyone who repents. The post shows how loving our God can be. He denies nothing to anyone who asks in faith. May he who strengthens us give you his blessings. God is the the genesis of our lives, he created us in his own image and likeness, he knows our in and out, what every our present situation is is known by God. The love he has for his children reached to the extent of sending his only begotten son to the earth to die and save us from our sins "He died in our place and rose again. This is what we celebrate at Easter." we shouldn't allow Jesus to die a second time in our live due to the sins we commit,we should stay pure and involve God in our dealings, because without the blessing from your father it is impossible to make it and also be at the top. thanks ma for this good and interesting write up. A relationship of father and child may not necessarily call for due process. God gave his son for us all even before we were yet sinners; not because we requested for it but because it was necessary. He didn't wait until we asked for it. Thereby, defiling the due process method that may have kept us in this form and shape today on planet earth. God's love is everlasting and He is in the business of providing us with what we need...Your posts are wonderful. This write-up reprimands us of the love God has for us his creatures irrespective of our unfaithfulness. As for me such is what love is and should be . In God's words and unconditional love I find solace. I always can't help but marvel at God's faithfulness, kindness, unending love and care for me, despite my faithlessness. His mercies endureth forever. You're blessed Ma! God's agape kind of love is indispensable for me. His only begotten son died for my sins in atonement for my debt, he is a father so loving and caring and would go to any limit to make his or her child happy and free from life's struggle. Truly, it is evident that Gods love for His children is so great. To cap it all, He dosen't look at our iniquities. He is always ready to forgive us when we ask for His forgiveness. This beautiful write-up also reminded us of how if our earthly father can't give us stones when we ask for bread and snake when we ask for fish, how much more Him our earthly father who created us. Thank you ma for this meditative post. Indeed, the love of God can not be over emphasized. And to demonstrate this, He sent His only begotten son to come and die for our sake. All we have to do is ask and it shall be given unto us, seek and we shall find, knock and it shall be opened unto us. Thank you ma for this wonderful meditative post. God loves us by sending his own son to come and die for us to redeem us from our sins and that is why he is the good Shepherd that cares for his flocks and that is the greatest and unlimited love he has shown to us . Indeed we could never pay the debt for our sins by ourselves. God saw this and showed us his love by sacrificing his only son for our sake. This is how love should be; selfless and giving. Thank you Lord for the gift of your son Jesus Christ. "He who did not spare His own son but gave Him up for us all-how will He not also,along with him graciously give us all things". This part really touched me. God will always give us whatever we ask of him. Since he was able to give up his son for us what more can't he give us. All we need to do is ask and God will surely do it. Love is proactive. He gave his only begotten son to die for us. God is love. His kindness for us is ever sufficient. The love of God is unending, he sent his only begotten son to die for us on the cross of calvary, he provided all our needs without looking at our sinful nature. This love is too excess lord! Thank you for your saving grace. Amen! God's love is so overwhelming that most times while thinking of it, I shed tears. For what cause did He give His only Son for our sins; Love. Love. The bible says that God is love. I don't think I know the half of it. God's love is not like human love that claims to love today and when the feelings fade, doesn't love anymore. God's love is an assurance. It is a foundation, a bedrock. I just know that no matter the situations present, God's love covers me. God really loves us!! The fact that he sent his only begotten son to come and die for our sins is a proof of this love. God loves us very much notwithstanding the fact that we are sinners. We can never make up for this love with our actions(even though we must try as much as possible to please him and act according to his word). God's love for us is not dependent or determined by our righteous deeds. Even in the bible, Jesus made it clear that he came not for the righteous, but for the sinners. We should indeed be grateful for this love!! There is nothing too hard for God to do for us. Ask yourself if the One who gave up His son for you will withhold His blessings from you. No! He only wants what's best for us. Too inspiring ma, He is our Lord and personal savoir, he is an excellent God whom his love will never stop to shower on us. His love is the kind of love that very human should dream of in life, he doesn’t change. He has started showing us his love from ‘day one’, he will never leave us in terms of trouble. He is a marvellous God. The love of God for man is everlasting, praise his name. God's love is the best of all.so pure and awesome...if he gave up his son for us then what cant he do for us...God only gives us what will not harm us even when we insist on things he knows will harm us..He is ever loving and ever kind.. there is none like him truly..
For God so love me that he gave his begotten son to die for my sins. He died and suffered on the cross just for me not to suffer again. He paid the price of salvation and redeemed our souls from sins and death. His love for us is everlasting. God really loves us his children; his love lasts forever ,his love never changed despite our misleads. He also gave his begotten son Jesus all because of his love for us. God adores us as his own and his love is incomparable that he sent his son to die for man, one of the many things that man can't do for his fellow human, God did for his love towards us. Easter season is a season I don't miss the celebration.. God gave his only son for us.. That is what I called love.. God is love.. Thanks for the motivational speech..
"The word of God is like a glass of cold water on a hot day,a soft bed when we're tired". what else do we need if not to make our bible our bullet prove in all situations of life.Ma God bless you abundantly,this piece is a relieve to a troubled mind,I think I now know where to get my bullet from "the word of God". I give praise to God the man who died for man.It is only God can do it.Took our place in death; He knew no sin but took the nature of sin and paid the debts we owed.Thank you Jesus for saving me! When i think of all the good things God has done for us including sending his only son to die for us so that we can be redeemed , i become so happy because i know i have salvation. Easter reminds us of this and it is a shame because most people don't see it as a big deal while in reality, it is. God's love for us is divine. His love is unconditional. Giving us all we need without asking for pay. Showering us with unmerited favor. His love supersedes. Blessed be the name of the Lord. God has shown us time and time again what true love really is. May it abound in my life forever. Thank you ma'am for sharing this. It’s a privilege to be called the daughter of Christ sometimes I wonder the dept of Gods love for us that he had to go through the pain of watching his only son die such a shameful death just for my redemption..what greater love can one ask for than this!!! God's love for mankind is immeasurable, His death and resurrection really depicts his love to us . When i watch the "passion for Christ" I can't help but cry for the pain He went through for me. Greater love has no man than this, for a man to die for his friends... In that while we are yet sinners Christ died for us. Is there such a love greater than this. Loving us not for what we did but because he sees himself in us. Truly, God is a definition of love. We love Him because He first loved us. Despite our flaws and sins, God still loves us. Ma, this is lovely. Romans 5:8 really breaks down God’s love to me. Sometimes, I end up wondering what manner of love this is that even while we were yet sinners, he loved us. His excess love is really king. Thank you Ma for sharing this. God gave us His son freely so I don't think there is anything He cannot give us freely. The only thing that is required of us is to believe God and ask in Faith because God is able to freely give us all things. God's love cannot be compared to man's love. He knows we are dependent and without him we cannot do anything. Therefore, the love of God is ultimate and still a mystery that can not be understood. This beautiful piece reminds me of God's undying love for me. I feel so blessed to enjoy such privilege! God's love is something that is beyond human understanding. He loves everyone that is why he gave us his only begotten son to pay for our wickedness. It always reminds me of how important am to my creator (God). God's kindness and love wouldn't let him see sinners die of their sins, therefore for man to be saved he gave his only son to die for our sins, what a love! This post reminds me of a wonderful song often sung in my lodge, the artiste I can't really recall-"Jesus you love me too much oh, too much o, too much o excess love o ". The love of God is a force that cannot be reckoned with. He loves us to a fault. I'm grateful that even in my unfaithfulness he remains ever loving and faithful.